This Sunday, April 14, a billion people will tune in for the premiere of the final season of Game of Thrones, the popular HBO series inspired by George R.R. Martin’s book series A Song of Ice and Fire . Back in season 1, we met the six Stark dire wolf puppies Grey Wind, Lady, Summer, Shaggydog, Nymeria and Ghost. Now, as we head into the eighth season, only Ghost and Nymeria remain. We will have to tune in this season to find out the fates of Ghost and Nymeria. But have you ever wondered about the story of the real animals behind these famous canine characters? Some people think dire wolves are fictional, like the amazing dragons in the series. But the now-extinct dire wolf is a real animal, not just created by Martin for the series! Until about 10,000 years ago, biologically modern humans shared the planet with dire wolves and their prey—animals like giant sloths and mastodons. Dire wolves (Canis dirus, which means “fearsome dog”) were built slightly differently than modern gray wolves. They were heavier and stockier, adaptations for feeding on their more famous megafauna dinner items. 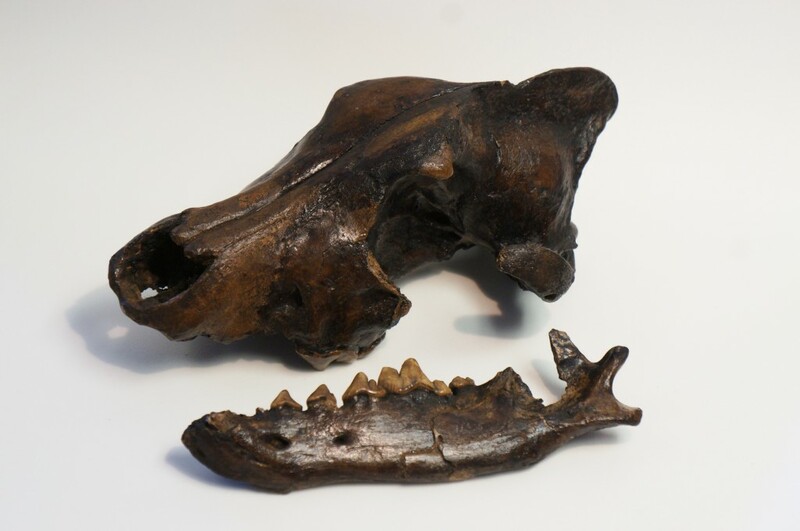 Today, we know about dire wolves from their numerous fossils found throughout North and South America. Interestingly, dire wolves are the most common fossil in the famous Rancho La Brea tar pits in California, where the fossils of over 4,000 dire wolves have been recovered. The Academy has 18 million scientific specimens behind the scenes, and one of them is the fossil specimen that was described to name and identify the existence of the dire wolf species, also known as the dire wolf type specimen. Type specimens are an extremely important kind of biological specimen. The scientific name of every species is typically based on the description and existence of one very important real specimen. A species name, such as Tyrannosaurus rex or Boa constrictor, is not just an idea. It’s tied to a real, tangible object that resides at a museum or a herbarium. Of the 18 million specimens in the Academy’s collections, 80,000 are designated as type specimens. One of the roles of a museum is to care for and protect for the public those aspects of our cultural and natural history that are deemed important for future generations. Natural history museums like the Academy are charged with maintaining scientifically accurate data about all living and extinct species. We make our collections available to the public through exhibitions, and we provide access to researchers. Although not every museum collects every species and we all have specialties, museums around the world store and protect the knowledge of every living thing that is discovered and studied. This post was adapted from the post Dire Wolf Bombshell by Timshel Purdum, published on April 6, 2015. How can a Member visit this collection and see and read more about the dire wolves? What are 5 things you can do to help the environment in under 10 minutes?